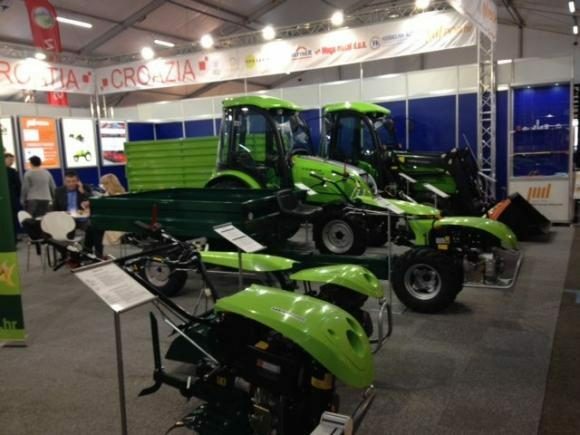 Startseite / High interest in the Croatian machinery! EIMA Bologna has traditionally been recognized as one of the largest and most important agricultural fairs. It’s a place where are met and created contacts between investors, commercial farmers, traders from the sector of agricultural machinery and distribution as well as manufacturers of agricultural machinery, industry suppliers, and designers. Dealers, distributors, professional farmers and private individuals from all around the world have shown great interest in Labinprogres program and equally for tractor and walking tractor range of products. There were exchanged important contacts. After the fair will be contacted potential partners from many countries such as Greece, Portugal, Spain, South American countries, Northern and Central Africa, Bulgaria, Ukraine, Azerbaijan, Latvia and others. From the past experience of Labinprogres, EIMA is a fair of global significance and Labinprogres found some of the most important customers and partners from Europe, but also from other continents, right at this fair. It is expected that after completion of the EIMA 2014 Labinprogres will continue to expand on the market through new partners from new countries, increase export and thus strategically position itself on the global agricultural market. It’s good to mention that Labinprogres – TPS exports 85% of its production and the company continues its activities in this direction. Wir behalten uns technische Anderungen, Modifikationen und sonstige Anderungen auf dieser Internetseite und im Katalog im Sinne der Weiterentwicklung ohne vorherige Ankundigung vor.